For the Bradshaw brothers, coming back to their hometown is the last thing they wanted. But to cope with family tragedy, they're reuniting in Benevolence, Washington—a place of hope, caring, and ever-surprising love . . .
It’s ex-Navy SEAL Porter Bradshaw’s toughest challenge ever—six grieving nieces and nephews. With his brother, Matthias, killed in a car crash, and his sister-in-law, Sunday, hospitalized, Porter must take his turn looking after their children and the ancestral farm. He doesn't know much about parenting. Still, Porter is used to going it alone professionally—and personally. But warm-hearted teacher Clementine Warren is a complication he can’t resist . . .
For Clementine, Benevolence is where her hopes for a real home and family crashed and burned. But as Sunday's friend and former neighbor, she promised to always be there for the children. And as she and Porter work to comfort the young Bradshaws, his sense of duty and passionate commitment are rekindling more than Clementine’s dreams. Now with trouble coming, she'll face down her fears to prove to Porter, and herself, that together they can make a future full of love . 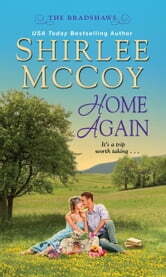 . .
Home Again, the second book in the Bradshaw series, is a fantastic small town romance that will tug on your heartstrings and keep you smiling. Porter Bradshaw knows he's in way over his head when he agrees to care for his brothers six adopted kids for two weeks. He loves his nieces and nephews but what does he know about caring for them. He's a former Navy SEAL who currently works in security in Los Angeles. That in know way prepares you for six kids! Luckily their neighbor Clementine Warren is great with them and willing to help him find his way. Along that journey Clementine becomes so much more than a neighbor to Porter. This is a wonderful sweet read and a book I recommend to everyone. Excellent read. Very enjoyable family story. Purchased other books related to this story and were all most enjoyable. Trouble to put down.